Former Arsenal striker Gervinho inspired unbeaten Roma to a first win for five games in Serie A as they beat Fiorentina to move back to within three points of league leaders Juventus. 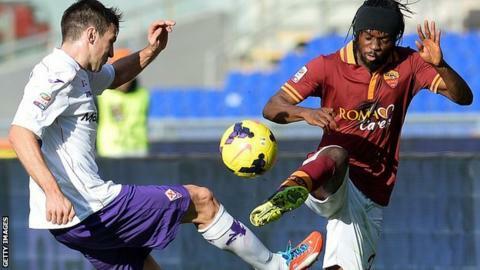 He created both Roma's goals as they ended a run of four successive draws. Brazil defender Maicon bundled in from close range for an early opener for the hosts before Juan Vargas levelled. Mattia Destro scored the winner on his first appearance of the season for Roma, who had Miralem Pjanic sent off. Roma have been struggling to recapture the form that saw them become the first team to win the opening 10 matches of a Serie A season earlier in the campaign. But, with talismanic forward Francesco Totti on the substitutes' bench after more than one month out through injury, Rudi Garcia's men recorded a deserved first victory since the end of October. Serie A is already threatening to turn into a two-horse race with third-placed Napoli having dropped five points behind Roma after their 3-3 home draw with Udinese on Saturday. Maicon put Roma ahead with his first goal for the club, the Brazilian bundling the ball home in the seventh minute after Ivorian Gervinho pulled the ball back. Fiorentina, joint fourth with 27 points, levelled on 29 minutes when Peru midfielder Juan Vargas rifled home from a Nenad Tomovic pass. Gervinho had a shot blocked and Kevin Strootman hit the Fiorentina post as the pressure mounted, with the winner arriving when Gervinho pulled the ball back and Destro, only on as a substitute for eight minutes, converted. Pjanic was sent off late on for a second yellow card for fouling David Pizarro inside the opposition's half. Elsewhere in Serie A, Marco Sau scored a brace for Cagliari in a 2-1 home win over Genoa, his winner coming in second-half injury-time after Alberto Gilardino had levelled in the 16th minute. A 19th-minute strike from Kamil Glik was enough for Torino to clinch a 1-0 home win over Lazio, who dropped to 12th, while Cyril Thereau's second-half goal was enough for Chievo to beat Sassuolo 1-0 away to move out of the bottom three. Sampdoria earned their first win under new coach Sinisa Mihajlovic with basement side Catania offering no reply to second-half goals from Eder and Manolo Gabbiadini. Verona reinforced their sixth place thanks to a 2-1 home win against Atalanta. Match ends, Roma 2, Fiorentina 1. Second Half ends, Roma 2, Fiorentina 1. Michael Bradley (Roma) wins a free kick in the defensive half. Manuel Pasqual (Fiorentina) wins a free kick on the left wing. Substitution, Roma. Michael Bradley replaces Mattia Destro. Second yellow card to Miralem Pjanic (Roma) for a bad foul. Hand ball by Nenad Tomovic (Fiorentina). Substitution, Fiorentina. Ryder Matos replaces Juan Vargas. Rodrigo Taddei (Roma) wins a free kick in the defensive half. Corner, Fiorentina. Conceded by Leandro Castán. Attempt saved. Joaquín (Fiorentina) right footed shot from outside the box is saved in the bottom right corner. Assisted by Juan Guillermo Cuadrado. Attempt blocked. Juan Guillermo Cuadrado (Fiorentina) right footed shot from outside the box is blocked. Assisted by Gonzalo Rodríguez. Corner, Fiorentina. Conceded by Daniele De Rossi. Gervinho (Roma) wins a free kick in the defensive half. Corner, Fiorentina. Conceded by Maicon. Substitution, Fiorentina. Joaquín replaces Massimo Ambrosini. Delay in match Massimo Ambrosini (Fiorentina) because of an injury. Offside, Fiorentina. Giuseppe Rossi tries a through ball, but Borja Valero is caught offside. Attempt missed. David Pizarro (Fiorentina) right footed shot from outside the box is high and wide to the right. Assisted by Borja Valero. Attempt missed. Mehdi Benatia (Roma) header from the centre of the box is close, but misses to the left. Assisted by Miralem Pjanic with a cross following a corner. Substitution, Fiorentina. David Pizarro replaces Alberto Aquilani. Substitution, Roma. Rodrigo Taddei replaces Adem Ljajic. Corner, Roma. Conceded by Juan Vargas. Attempt saved. Manuel Pasqual (Fiorentina) left footed shot from outside the box is saved in the top right corner. Leandro Castán (Roma) is shown the yellow card for a bad foul.